The CNN SciTech Unit is taking the show on the road. 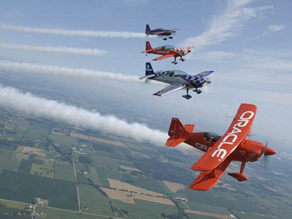 This week I’ll be in Oshkosh, Wisconsin for EAA AirVenture, the annual air show and aviation convention that hosts all-things-winged for one week in late July. The population of this charming town on Lake Winnebago nearly doubles as three-quarters of a million aviation enthusiasts and pilots descend, literally, for their yearly pilgrimage to the show known simply as “Oshkosh.” The usually sleepy Wittman Regional Airport will become home to the world’s busiest air traffic control tower, handling nearly 10,000 private airplanes that fly in and out of the event. Expect to see the newest, cutting-edge airplanes—from frontline fighters like the Air Force’s F-22 Raptor, to new introductions into the very light jet market like designs from Eclipse, Honda, and Cirrus Design. Also, you won’t want to miss the afternoon air show, where the world’s most talented pilots put on a magnificent sky dance. It’s a pilot’s mecca—a great American tradition, one that I’ve been taking part in since I was in grade school. But that tradition may be at risk this year. With prices for aviation fuel soaring over $5 per gallon, many pilots may be leaving their airplanes in the hangar and canceling their Oshkosh plans. A new hope may be on the horizon, though: greener alternatives, like biofuels and electric power, may set a new course for the aviation industry. It’s yet to be seen whether the fleeting economy and increased expense of flying a private airplane will have a profound effect on the show’s attendance. Aviators are of a rare breed and it would take a lot more than hefty costs to stop many of my pilot friends from making their annual trip. As for me, I’ll be making my pilgrimage to Oshkosh once again this year—the fifth in my logbook—by air. Check back for updates from the show throughout the week on the SciTech blog. we will see you there, party of 4 coming in from ca. az, and nm. keep us updated till we get there. Electric power for an aircraft? Are you crazy? It's not even practical for cars where weight is less critical and you only need about 20hp to cruise. Journalists! Go to the end of the blog for details. I'll be around the SMO diesel aircraft engine display area. Electric power is one of many suitable aircraft alternatives. Do your research. I read and am responding to your post as I sit in the Atlanta airport, waiting for my connecting flight to OSHKOSH! Unfortunately I must take the aluminum mailing tube (aka airlines) to get there until I complete my Vans RV-7. I live in this area and work in the construction industry. Every year at this time i always get excited for working outside and seeing all the different aircraft fly through the area. From old bombers to new jets, for one week it sure is great to have EAA happen here. Actually, there are two electric powered motor gliders on the market today. I heard the makers of Sonex are about to release an electric airplane. I'm sure they'll have a prototype at Oshkosh. The engines are actually fine, it's the batteries that are the problem. Click on anything that says T-Rex 500. Remember as you watch, these things are carrying their own batteries. These ain't your daddy's batteries. And tomorrow's will be even better. Upstate New York, just outside Schenectady has a great air show each year.... this one sounds much larger...but they are all exciting to be around. Numerous Atomic battery designs for other applications. Just a matter of time, before a 10 year long flight. Oh yeah, that's what I consider a suitable aircraft. 17 hp, 70mph, 1.5 hr duration. Killer! Apparently you've done my research for me there, Jacob. If that's the state of the art for electric aircraft then I rest my case. Not one commenter could provide an example of an aircraft that even comes close to the performance of say a Cessna 152. RC? Really? That's great, Tom, as long as you're a dust mite. And atomic batteries? Are you talking the micro-amp or pico-amp range? compuer fans are always made up of brushless motors because they last very long "
Your mode of telling the whole thing in this article is genuinely nice, all can without difficulty know it, Thanks a lot. What's it all about? Algae! Are you ready for some biofuel adventuring?